Forged Fantasy, Hothead Games’ new action role-playing game, lets you build your team of heroes and control them in epic 3D battles. The game puts you in direct control of a character in third-person view. While fighting enemies, you can quickly switch between different characters in real-time battles. You will have full control over your heroes. If you feel your current hero is being attacked by multiple enemies, you can just switch to a ranged hero to attack them from a distance. If you need to heal a hero, just switch to a healer and user her powers to help him regain HP. This unique “switch” feature makes gameplay more enjoyable and engaging. With the right combination of heroes, you can employ your own tactics in every mission. Find out how to make your heroes more powerful, when to switch heroes during battle and how to deal bonus damage to enemies with the help of these Forged Fantasy tips, hints and strategies. On your team selection screen, the character added on the first slot is the one you will control when the battle begins. However, you can switch to a different character any time during battle. You should change a hero when his/her skills are needed the most. 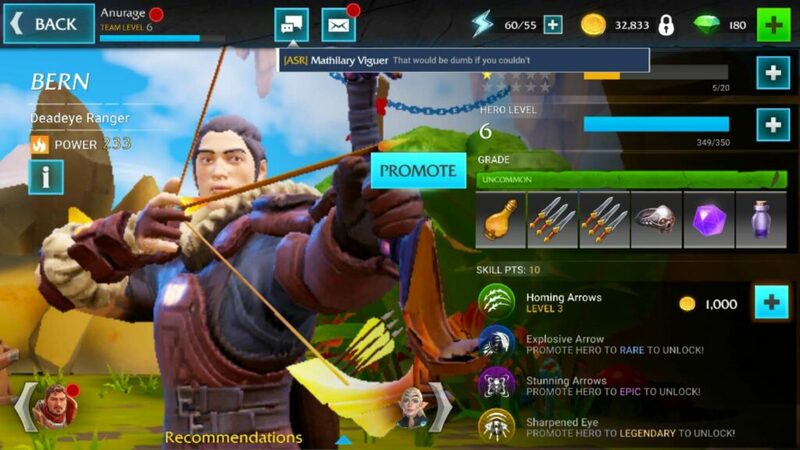 For example: If you are controlling a melee hero, such as “Ram”, and he is being surrounded by ranged enemies, quickly switch to a skilled ranger, such as “Bern” and target all enemy rangers. Ram will always be the center of attraction as he has to move closer to an enemy to attack and if he is in the middle of the battleground, naturally he would be an enemy ranger’s first target. If he is surrounded by ranged foes, it would be a wise choice to switch to a ranged character or some other hero that deals AoE damage and control him/her take down all enemy archers, grenadiers and crossbow men. It’s all about team work and the situation you are in. Switching to the right character will surely help you defeat enemies without taking much damage. For certain characters, such as Bern (ranged) and Aura (support), actions play a vital role during battle. They usually appear for heroes that are behind barricades. When you tap and hold the screen above such characters, a set of actions will be displayed on the screen. Now you just have to drag your finger to a particular action to make your hero perform it. Dragging your finger towards the left or right action icon lets your hero move from one barricade to another quickly. Move your finger to the top action to make your character stand up or the bottom action to make him duck. If a melee enemy starts attacking your ranged hero, quickly drag your finger to the left or right action button to move to a different location. If a ranged enemy is attacking your ranged hero, you can move to another barricade or drag your finger downwards to duck. You can then tap the attack button and the aiming reticle will automatically lock itself to an enemy. Aura, the healer is one of the most important heroes of Forged Fantasy. You can control her to heal other heroes and also use her powers to attack enemies. Although she has a slow attack rate as it takes a few seconds to charge her wand before attacking, the damage dealt to enemies is higher. She heals a hero when you tap her skill. She will continue doing her job, healing other team members and attacking enemies even when you are not controlling her. However, her HP is lower than other heroes, which is why you should level her up or equip gear to improve her stats, such as health, armor etc. Since a hero’s level is locked at the team’s level, it would be a good idea to equip gear to your healer to improve her stats soon after she reaches a level same as the team’s level. Headshots deal extra damage to enemies. Keep this in mind when controlling a ranged hero, such as Bern, the archer. Set the aiming reticle at the head of your opponent and then tap the attack button. You will notice his HP decreasing much rapidly than before. It will take a few shots to kill him if you aim for the head. You should switch to another hero if he/she has an elemental advantage over enemies in a battlefield. Each hero boasts an element which is weaker/stronger versus an enemy’s element. There are three types of elements: Nature, Fire and Water. Nature is stronger versus Water. Fire is stronger versus Nature, and Water is stronger versus Fire. If you are controlling a water element ranged character, then you should target a fire element enemy to deal bonus damage to him. Before a mission, you will get to select a team of 5 heroes. 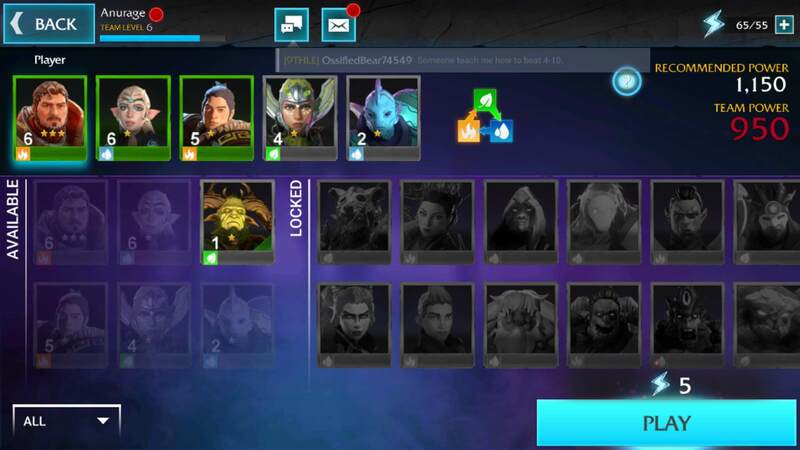 Whilst you must select the best characters from the list of available heroes, you should also consider choosing at least three different characters belonging to three different elements. Always have a ranged, tank and healer in your team, but just make sure they belong to different elements. Note: You won’t come across every enemy having an element type. Some just don’t have it. You will have to make use of the best hero against an enemy without an element. For example, use archers against melee or use ranged units against archers attacking your melee Hero. You can level up a hero using “Hero XP”. Leveling up improves a hero’s stats (health, damage, armor, crit damage etc.) and power, which ultimately increases your total team power. You can get hero XP from campaign missions or by completing quests and achievements under the “Quests” tab. You will also get hero XP as login rewards on certain days. Keep playing Forged Fantasy daily to claim your rewards. Your hero’s level is tied to your team’s level. Simply speaking, it can’t exceed your team’s level. You will have to increase your team’s level if you want to improve your hero’s level. You will need team XP to level up your team. Keep winning campaign missions and completing daily quests to earn team XP. 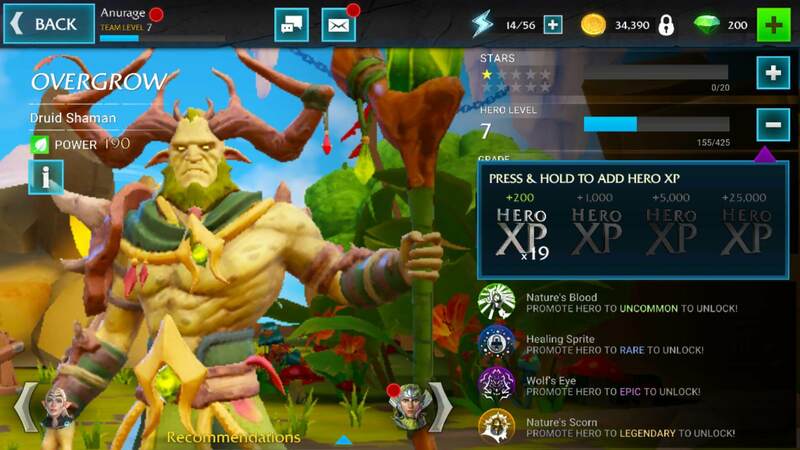 For example: If you level up your team to 6, you can level up all heroes to level 6 using Hero XP. However, you can’t go beyond that until your team’s level is 7. Your archer’s aim automatically moves to the next enemy, but in case you feel that other enemies are more dangerous than the current one, you can always move your aim towards them. When controlling a ranger, use your left thumb to move the aiming reticle from one enemy to the other. Scan the environment to see which enemy is the biggest threat and then move the aim towards that enemy to attack him. If you think that a grenadier is more of a threat as he deals area damage, move the reticle towards him and tap the attack button. Attack his head to eliminate him quickly. Forged Fantasy will introduce new enemies in a very cinematic way. A brief description about the enemy type and his/her special abilities will be displayed beside him. The cinematic introduction goes away when you tap the screen, so there’s enough time to note down their expertise and abilities. Make a note of their type and abilities as you will come across more enemies like him during combat. You can then switch to a hero who can deal with that enemy. 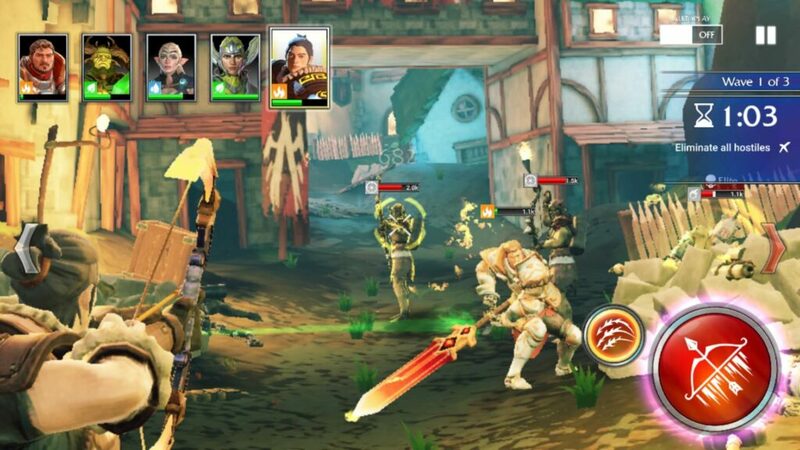 For example, when the game introduces the “Fallen Grenadier” who is expert in ranged area attacks, you must switch to a ranger to quickly eliminate him before he deals more damage to your team. You will also get a list of enemies on the mission screen that appears just before battle. Tap each enemy’s portrait to know more about him. However, newer enemies are always introduced in a cinematic manner. As you progress, you will come across tougher enemies. It won’t be easy for you to complete a mission even if you have 5 heroes in your team. You must improve your team’s power if you want to increase your chances of winning a campaign stage. The best way to increase team power is to equip gear to your hero. You can do this via “Heroes”. Tap a hero’s portrait and then tap a yellow plus sign on the empty slot to add gear piece to it. You will get gear items from campaign missions. Your team’s total power is displayed on the mission page. Tap “campaign” and then tap a mission. A new page shows a list of villains you will encounter during combat. Tap “continue”. The next page shows you your available heroes and power. Your team’s power should always be equal to or greater than the “recommended” power if you want to put up a good fight against enemies. A single gear item can improve a hero’s power and stats. However, if you obtain a complete set, you will be able to promote him. To complete a set, check if all empty gear slots have yellow “plus” icons. Just tap the “Equip All” button to automatically add all gear items to their respective slots. In Forged Fantasy, promoting a hero not only improves his/her stats greatly, but also unlocks new skills. However, you will have to promote a hero to a certain “rarity” to unlock his skill. For example: You can unlock Bern’s second skill only when you promote him to “rare”. To do this, you will have to promote him several times until he is promoted to “rare”. You can get gear items from missions, silver and gold chests at the shop, black market etc. Campaign missions are your best bet if you want to farm gear items. You can replay a mission to get them. Make sure you tap “Quick Win” on a previously completed mission to get gear and other rewards instantly. Try to get three stars in every new mission to enable quick win. You lose a star if you lose heroes. Using a hero’s skills from time to time will surely help you during combat. But as you move to uncharted territories, you will come across more powerful villains. Your hero skills won’t be as effective as before when you confront these enemies. You must upgrade your hero skills from time to time. To do this, tap “Heroes” and then tap on a character’s profile pic. Now tap the plus button beside his unlocked skill to upgrade it. You will only need coins to upgrade a skill. As you progress, you will be able to collect lots of powerful heroes in Forged Fantasy. They will be of great help during battle. The more heroes you have, the easier it will be to craft a stronger team. You will obtain some heroes for free, especially in the beginning of the game. You will get Venom and Overgrow early in this game. For the rest, you might get them as rewards for completing certain missions or collect fragments to unlock them. You will need at least 10 fragments to unlock a hero. To get fragments for a particular hero, find them first. Go to “Heroes” and then tap a locked character’s portrait. Now tap “Find Fragments”. The game will show a list of places where you can get a hero’s fragments. Could be chests or a particular mission. If it’s a mission, and you have already completed it, just replay it to get more fragments. Hero, Gold and Silver Chests: Tap Shop > Chests to get a list of chests. The gold chest is available for free every 8 hours. You can open a free silver chest every 10 minutes. You can also spend coins to open a silver chest if you can’t wait for 10 minutes. You will need gems to open a hero chest. This chest guarantees at least one 3-star or higher hero. Black Market: You can purchase fragments at a discount from the black market. Spend coins on the most valuable heroes to get their fragments. Daily Login Rewards: You will receive fragments for a single character each month, so make sure you play this game every day. For this month, you will receive Barricade’s fragments. PvP Chests: You will have to unlock PvP first. Once unlocked, play against other players. 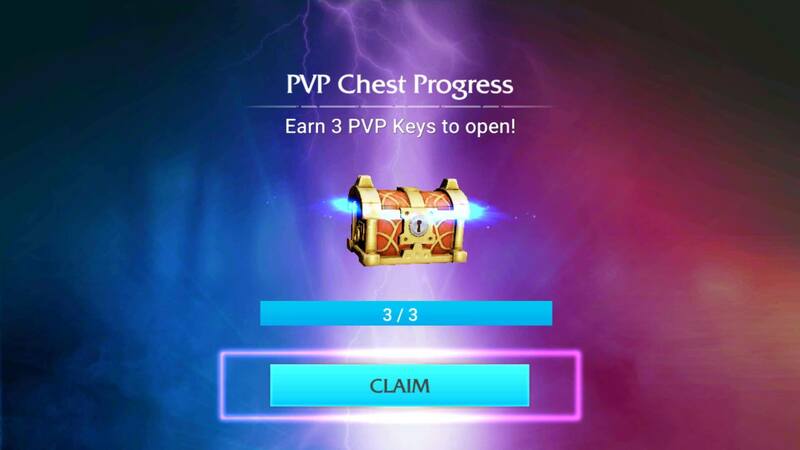 You will need several “PvP Keys” to open a chest. You will receive 3 keys on winning a player versus player match and 1 key if it’s a loss or a tie. To know what fragments you may receive from a PvP chest, tap “Chest Info”. Missions: Completing certain missions will let you win an entire hero. For example, finishing Mission 1-10 will unlock Venom. Once you unlock the hard mode, you can play older missions to get more fragments. Achievements: Certain achievements also grant hero fragments as rewards. Tap quests and then go to the achievements tab to find them out.